At elevated temperature, oxygen and hydrocarbon molecules react to form carbon dioxide and water. A catalyst enables hydrocarbon oxidation to proceed at much lower temperature (250 to 600°C) than is required for flame type combustion. Low temperature operation and efficient heat recovery from exhaust flow minimize the energy required to destroy vapors, minimizing power costs. FALCO electric catalytic oxidizers use precious metal catalysts (Platinum and Palladium) for destroying non-chlorinated hydrocarbon vapors (a base metal catalyst is used to treat CVOC’s). The precious metals are deposited on a wash coat of high surface area Alumina. This wash coat is then adhered to a support structure. The resulting catalyst has a large surface area covered with reactive sites. Clariant is our major supplier. Vapors entering the FALCO electric catalytic oxidizer are heated by a counter current of exhaust in an adjacent passage. Depending on application, heat recovery efficiency is adjusted either manually or automatically. With a maximum heat recovery adjustment and energy content of source vapor greater than 3.2 Btu/ft3, sufficient combustion heat is recovered to bring inlet vapor to reactive temperature without added electric heat. If source vapor energy content is less than 3.2 Btu/ft3, electric heat makes up the difference. Breakeven operation occurs when recovered combustion heat matches the heat required to pre-heat the inlet flow (zero electric heat). With sufficient source vapor concentration, breakeven is the normal mode of operation. The input concentration maintained by the control system in breakeven operation increases as heat recovery efficiency is reduced. The energy content of source vapor is often a large multiple of the 3.2 Btu/ft3 minimum needed for breakeven operation. By reducing heat recovery, the input concentration maintained in breakeven mode can be increased to about 8 Btu/ft3. In this way, with a high concentration vapor source, reduced heat recovery enables operation at maximum loading. Conversely, maximized heat recovery enables energy efficient operation with a low concentration source vapor. Industrial and Soil Vapor Extraction (SVE) applications employ different modes of control. In SVE, source vapor and dilution flow are simultaneously controlled by the Vapor Control Valve (VCV), and heat recovery efficiency is manually adjusted. In industrial applications, a variable frequency drive (VFD) adjusts dilution to keep temperatures within set limits. Heat recovery decreases automatically with increasing flow so that maximum treatment capacity is available at maximum flow. In both control modes the breakeven condition is approximated through a broad range of source vapor concentration, minimizing power use. 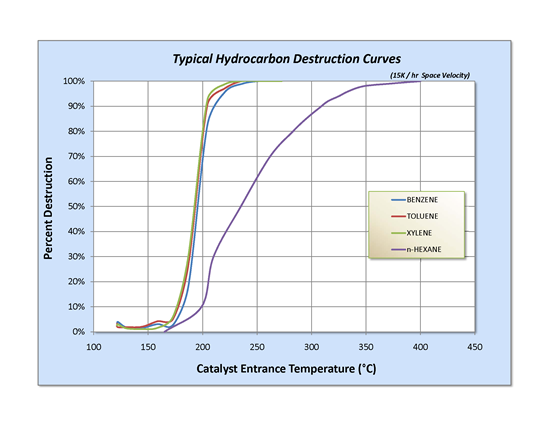 Destruction efficiency with catalytic oxidation is tied to flow rate and inlet temperature. Below is a graph showing a typical destruction curve for hydrocarbons. Percent destruction (conversion efficiency) increases with increased entrance temperature.